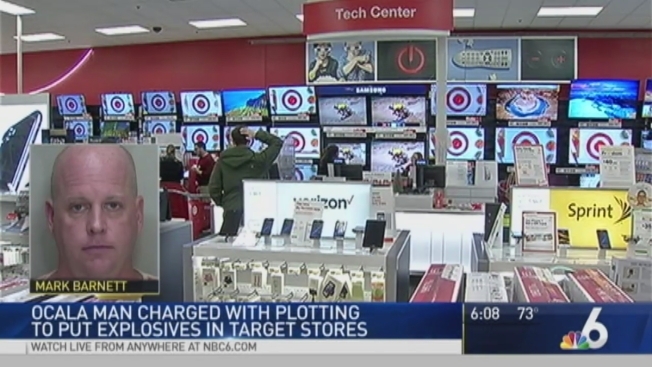 A Florida man is accused of plotting to put explosives in Target stores in an attempt to get stock prices to drop so he could buy stocks, prosecutors say. A Florida man has been sentenced to 40 years in prison for planning to place bombs on the shelves of Target stores in an attempt to drive the company's stock price down. A federal judge in Ocala sentenced 50-year-old Mark Barnett on Wednesday. He was convicted in July of attempted arson and other charges. Authorities say Barnett offered a confidential source $10,000 to place homemade bombs disguised in food packaging on Target store shelves from Florida to New York. Investigators found bomb-making materials at his house. The devices never made it to the stores since the confidential informant turned them over to authorities. Authorities say Barnett had purchased options on Target stock that would pay out when the share price dropped.